Virginia schoolchildren aren’t taught where to seek shelter during earthquakes. Families and public officials are more concerned with fire and flooding than seismic activity. But in 2011, a rare earthquake rattled the nerves of Virginia residents and U.S. Geological Survey scientists in the state. Nearly three years later, those scientists have installed a 20-station seismic monitoring network to learn why earthquakes sometimes occur in the least likely of places. Emanating near Louisa and Mineral, Va., the August 2011 quake measured at 5.8 on the Richter scale, unusually strong for seismic activity in that area. The earthquake was felt from Georgia to Maine, and even as far west as Chicago. Pratt and his colleagues understood that the five seismometers operating in the area at the time would not be able to provide the comprehensive data necessary to analyze the earthquake. The decision to create a more accurate network started as a friendly discussion over drinks. The solution, they decided, would require both an increase in quantity and sensitivity of the seismometers. The USGS researchers turned to the Incorporated Research Institutions for Seismology to obtain the instruments on loan for several months. The team installed 20 Mark Products seismometers and REF TEK data loggers from Charlottesville to east of Richmond, Va. Each cylindrical seismometer is about six inches tall and four inches in diameter, with an appearance of a soda can, or “a really fat coin”. The instruments are buried one foot underground and attached to car batteries, AC adapters or solar panels for power. Data loggers kept in nearby containers record measurements taken every couple of milliseconds. 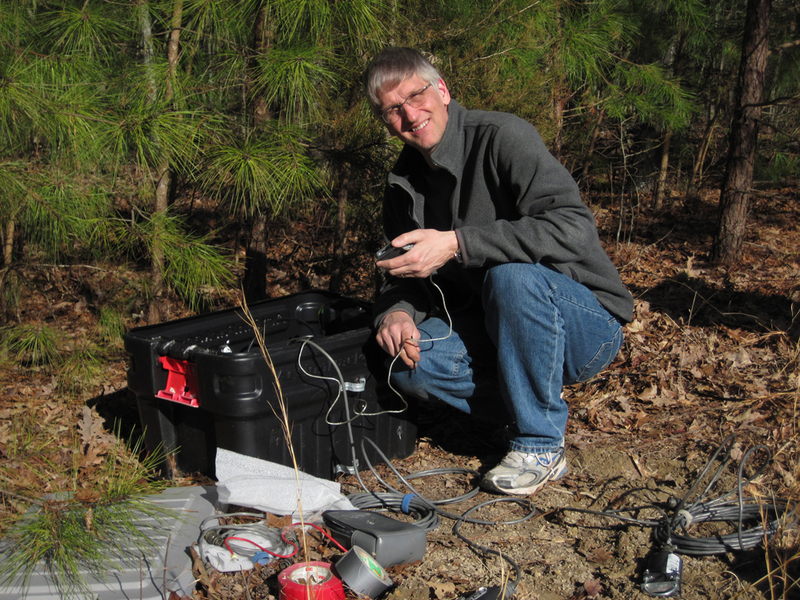 With relatively little time to collect data, Pratt and the other researchers increased the seismometers’ sensitivity to produce more measurements. Any significant seismic motion is recorded by the network and placed in a database for further study. Although the seismometers will be in the ground for just a few months, Pratt said he hopes the loan can be extended to a few years — or even indefinitely. Some of the recently installed seismometers are part of the EarthScope program, which monitors seismic activity across the country. The program’s network has 160 stations on the East Coast, but Pratt said more are needed. Citing the 2011 event, as well as a destructive earthquake that struck Charleston, S.C., in 1886, Pratt said a number of uncommon — yet violent — quakes have hit the east and southeast regions of the U.S., leaving scientists baffled. “Once we understand these earthquakes, it will help us understand how we get [earthquakes] in other unusual areas,” he said.